Putting a $ amount on a brand is very hard. For a financier, a brand is something valuable but not essential. In fact, a financial analyst would take a practical approach. For instance, by looking at assets on a balance sheet (like patents and trademarks) and computing the overall value of those. Yet this would neglect the value of the interactions between those “intellectual properties” and the minds and people tied to the business. For an accountant that is just a headache. That is why accounting methods have neglected it for hundreds of years and still do. In fact, often it’s possible to put a $ amount on a brand only when a company gets sold. Whatever surplus is left after the sales, accountants put it under the umbrella of “goodwill.” Almost like someone trying to hide dust under the carpet; when there isn’t a better place where to dump that. For an anthropologist, the brand is all that is. In fact, he would go on saying how the value of your business over time will be based on how hard you worked in persuading people believing in your company’s myth. The stronger the myth, the stronger the brand. I like a holistic approach based on the one thing – I argue – that captures the value of a business in the long-run: its business model! Sergey and I founded Google because we believed we could provide an important service to the world-instantly delivering relevant information on virtually any topic. Serving our end users is at the heart of what we do and remains our number one priority. Google has created the most powerful search engine that proved to be the most reliable alternative for users. In fact, each day billions of queries go through Google. People ask any question. From very practical questions like “how to tie a tie” to more existential ones like “why am I like this.” Users all around the world can rely on Google’s AI-powered algorithm to read and understand their queries. Without that focus on providing a superior product, Google wouldn’t have become what it is today. However, that is the first part of the equation. We are often bound to believe – especially in tech – that is all about the product or service you offer. I want to show you why that is not the case. Take Apple, 63% of its revenues come from the iPhone. Therefore, you might think that is what makes this company profitable in the long-run. That is an oversight. What makes Apple sustainable in the long run it’s the hardware and software ecosystem it created around those products. Take Google. You might think that since Google is the best search engine out there, that is why it makes 88% of its revenue from advertising. However, for how marvelous Google search algorithm is, what makes Google the tech giant that is today; is its business model. AdWords and AdSense together create a win-win-win. Companies can sponsor their products for much cheaper, and track their results with no effort. Online publishers can easily monetize – something is better than nothing – their content. Users get relevant answers to any question they might have. A great product is a little part of the equation. The rest is about business modeling! In fact, a business model is what helps companies capture value in the long-run. If you do not have a business model, you might not have a business. Back in 1999, it was already clear that Google was the best search engine out there. It wasn’t clear though how it was supposed to make money. In mid-1999 Page and Brin met Bill Gross, founder of GoTo.com search engine. Gross had an idea. Rather than rely on the old advertising model based on CPM or cost per mille – in short, advertisers would get paid on the number of impressions of an ad. Gross thought of a new model, based on CPC or cost-per-click. A company would pay an advertisement only if a user found it so relevant to click. At the time Page and Brin were still reluctant about using ads to monetize Google. Yet the company was burning cash, and by the year 2000 investors were getting nervous. When Page and Brin were approached again by Gross, which proposed to merge the two companies, Google’s founders declined. Why? Because they didn’t want their search to be associated with a company that mixed paid advertising with organic results. Today Google generates over 88% from advertising, of which CPC is the primary driver. In 2002 Gross sued Google for allegedly stealing its cost-per-click model. In 2003, Google‘s employee Paul Bouchet developed a feature that allowed the matching of words sent through Gmail with keywords bidden by advertisers. That generated ads profits with the CPC model. Therefore, any “Web property” was a good candidate to become a Google partner and generate profits for their content independently from advertising middlemen. What’s the take here? I believe there are two main ones. First, a business model well designed can make a business go from zero to a billion, just like it did with Google. Second, at times when a company grows at the size of what Google is today, it’s hard to remember that back then it was a disruptive force that “democratized” the web, allowing small blogs and small businesses to make money online! AdWords and AdSense combined made Google among the most powerful tech companies in the world. Of course, Google managed to get there because it was backed by a great service, a search engine able to have you find any kind of information in a web made of billions of pages. Yet, without such a powerful business model that search engine today wouldn’t exist. Also, most if not all Google existing applications (Google docs or Gmail to mention a few) wouldn’t exist if it wasn’t for the stream of revenues generated over the years by Google‘s business model. That is how Google went from zero to over eight hundred billion of market capitalization! 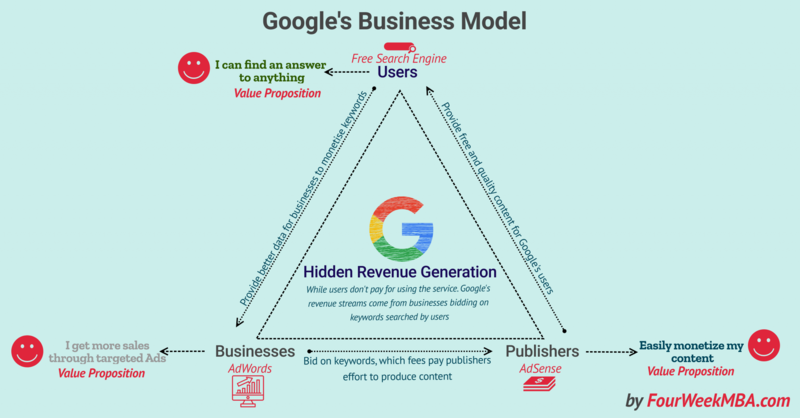 How will Google’s business model look like in the future? As of 2017, Google still got 86% of its revenues from advertising. However, it is important to notice how other areas of the company are growing pretty quickly. For instance, the other part of the business which focuses on App purchases through the Google Play store, the Google Cloud offering, and the Hardware product was in 2017 a $14 billion a year business. Compared to 2015 when it represented just $7 billion. This shows how Google is investing in other areas that might well represent its main way of monetizing in the years to come. Another critical aspect to look at is the Google “other bets” a set of risky, yet visionary attempt of Google to shape the future of humanity via technology. Will any of those be the next big hit?